Unchana Withayathamthat is an expert on international and regional trade, economics and investment. She is also a senior lecturer at Chulalongkorn University, Kasetsart University, Ramkhamhaeng University and the National Institute of Development Administration. 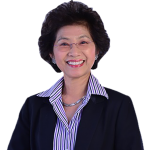 Unchana comes to BGA following a long career in the Thai government where she held a series of high-level leadership positions in trade and investment. She participated in negotiating the ASEAN Free Trade Area (AFTA), the ASEAN Economic Community (AEC), the ASEAN-India free trade agreement, the World Trade Organization Doha Round and the Thailand-Europe free trade agreement. She has particular expertise in the use of tariff preferences and international investment promotion. Unchana’s career in the Thai government culminated with an appointment as inspector general of the Ministry of Commerce from 2010 to 2012. Previously, she served as deputy director general for the Department of Trade Negotiations (2007 and 2010) and as deputy director general for the Department of Foreign Trade (2007-10). She was also a senior expert on Trade Measures in the Department of Trade Negotiations and director of the Bureau of ASEAN Trade and Economic Affairs. Unchana holds a bachelor’s degree in economics from Thailand’s Chulalongkorn University and a master’s degree in public and private management programs from the National Institute of Development. She holds multiple diplomas and certificates in security studies from the National Defense College of Thailand.